What Makes an Energy Efficient Home? When talking about energy efficient homes the entire house needs to be viewed as a complete system rather than looking at each component individually. As most people are aware, there are several different factors that go into making a home energy efficient. Some of the more well known factors are framing construction, insulation type, window quality and heating and cooling systems. While each one of these components are important, how they are used together along with other details from when the plans are designed to the completed home is the most important component of making a home truly energy efficient. 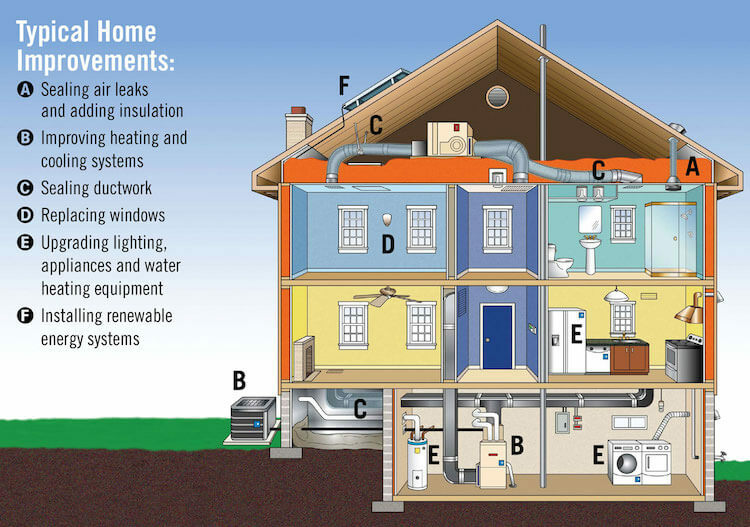 How the home is designed and framed is a major factor in energy efficiency. While some homes are built using standard 2×4 framing, others are built using staggered 2×6 construction. Staggered framing methods allow for less continuous space inside the walls. When looking at home plans be sure to consider the type of framing used. Another important factor in the overall system of the home is the insulation. There are many types of insulation and in addition to the insulating value (the R-value) how the insulation handles and reacts to moisture is another important factor. The definition of R-value is a measure of the resistance of an insulating or building material to heat flow, expressed as R-11, R-20, and so on; the higher the number, the greater the resistance to heat flow. This means that a higher R-value translates to less heat escaping through the insulation. Typically, you want to have insulation with an R-value of at least 20 in your walls and an R-value of at least 38 in your attic. The types and R-values of insulation vary greatly to be sure to pay attention to the types of insulation being used throughout your house and be sure that they are increased if you live in hotter or colder parts of the country. (See requirements based on region of the country here: http://energycode.pnl.gov/EnergyCodeReqs/ ) While you need to think about the cost of heating your home you also need to consider the costs to cool it so you want to be sure it is well insulated to keep heat in during the winter and heat out during the summer. Some of the small construction details that many people never see are another very important part of the overall efficiency system of your home. These include such things as whether or not the duct work is sealed. The ductwork is how your heat and air conditioning is dispersed throughout hour home. If there are leaks in your duct work you will be losing heating and cooling to the insides of your floors and ceilings rather than having it all dispersed to the living areas of your home. Other details include how holes in the framing for electrical wires and such are handled. Are they sealed with spray foam or the like or are they left open. Wiring holes inside your walls allow for air flow and consequently facilitate heat and cooling loss. What about where the trusses meet the walls and where the walls meet the foundation? What is done in these areas? This is another important area to consider along with how your home is ventilated and what the air flow is. Proper ventilation and air flow is also another very important piece of the overall energy efficiency of your new home that often gets overlooked. The actual efficiency of your heating and cooling systems are also very important. There are up to 98% efficiency units available for both air conditioners and furnaces available on the market today. So, be sure to ask your builder what type of furnace and air conditioner they are including with your home. Spending a little more money on a more efficient unit when you build your home could translate into hundreds or even thousands of dollars of savings in utility costs over the amount of time you are in your home. Windows and doors are another important part of the overall energy efficiency of your new home. Pay attention to the types of windows and doors being used in your home. Windows and doors come in all types of qualities and are another way you can spend a little more money up front to save a lot of money on utility costs over the time you are in your home. When considering what types of windows to include in your home also consider whether or not they need to be opened as continuous windows can be more energy efficient than sliding windows. So, when building your new dream home be sure to remember that overall home energy efficiency is based on viewing your home as a system. You need to consider how each individual component of energy efficiency is working with all of the other components in your home rather than spending time and energy focusing on only a couple components. Viewing your home as a system and placing equal importance on each part of that system will help save you hundreds or even thousands of dollars in utility costs!